Koi are cold water pond fish. Most of the koi can grow up to 30-40 cm / 12-15 inches, but some koi like the japanese koi have been knonw to grow up to 50-60 cm / 20-24 inches. They live in water parameters of PH range 6.5-7.5, and temperatures of 15-25Celsius / 59-77 °F. 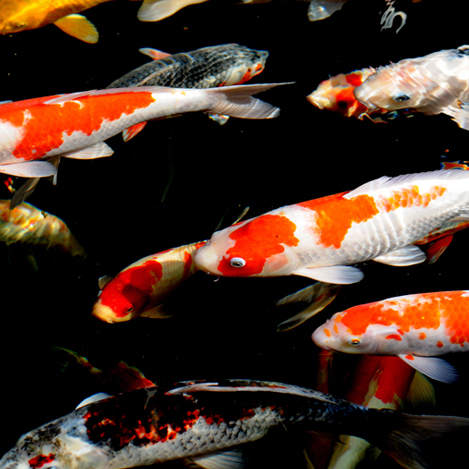 Koi are a group of fish that are ornamental varieties of domesticated common carp. There varieties are distinguished by colouration, and scales. 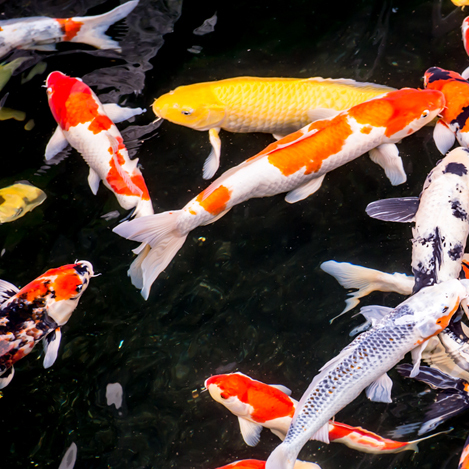 A few of the major colours of the koi are white, black, red, yellow, blue and cream. 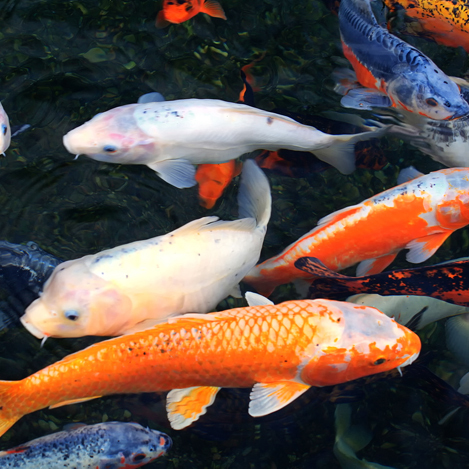 A few of the different varieties of koi that are more well known are butterfly koi, ghost koi, ogon koi, showa sanke koi, there are plenty more. 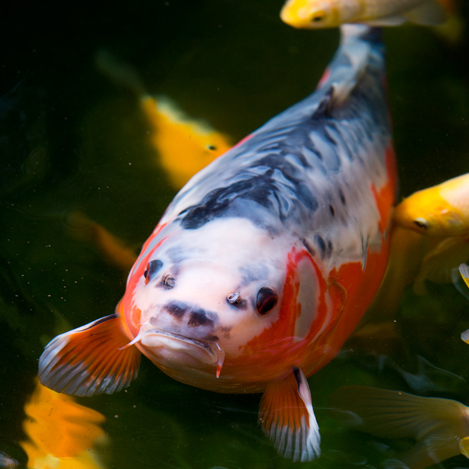 Koi are not really aggressive fish. They can mix with most pond fish, however because of there size and how big they can get, try not to mix them with anything to small. Because of how big they do get, they will require a big pond. Really three foot deep and deeper is recommended. They will eat any food you put in the pond as they are a greedy fish. So feeding and scattering the food round the pond is a good idea allowing your other fish to feed. Koi can get very tame, and you can pick a spot to feed them every day and they will learn to keep going to that same spot to be feed. They can Feed out of your hand if you get them tame enough. Koi will eat flake, pellets, and stick foods. As they grow you can go for bigger size pellets, as they do have large mouths. They do like frozen, or live foods as a treat, in ponds a lot of this is found naturally in the pond. We know people who feed them on bread, oranges, sweetcorn, and a few other treats. But we do like to stress these are very high in protein and should only be fed in a mature ponds, not very often, and never through the winter months. In winter they should only be fed if they are at the surface looking for food. If they are dormant on the bottom of the pond do not feed them and only feed them lower protein foods, this is because they can not digest the high protein foods in colder water so wheat germ based foods are best. Koi are greedy fish they will eat all day and eat anything you put in for them. As they get big mouths they will eat sticks, pellets, flake and also bigger size treats. Also live and frozen foods are good as a treat. Feeding them once to twice a day in the summer is fine but keeping an eye on your water levels is a good idea as water can go off very quickly with extra food that is feed. In colder weather food needs to be feed very carefully a low protein food is best like winter stick and wheat germ foods. Or if the fish do not come up to the surface do not feed them at all.